Medway Council and Kent County Council Road Safety Teams are joining forces to bring a vital message to the county in the hope they can reduce the number of pedal cyclists and motorcyclists being injured in road crashes. The campaign will roll out over May through to the end of June and sees over 120 highly visible roadside boards depicting the message: “Look Once Look Twice, Think Bike” and “Look Once Look Twice, Think Cyclist” to drivers. The boards will be at key sites across Kent and Medway where crashes between cars and motorcycles/bicycles have occurred, resulting in someone sadly either being killed or injured. Motorcyclists make up less than one per cent of road users yet they account for almost a quarter of all road user deaths every year in Kent and Medway. Last year in Kent and Medway over 350 pedal cyclists and 400 motorcyclists were killed or injured in crashes where other vehicles were involved. 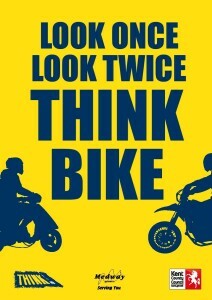 Medway Council’s Road Safety Manager, Bryan Shawyer, said: “In the past crash statistics persistently prompt attention to address motorbike crashes, however over the last few years there is a worrying trend in the number of collisions involving people on all bikes and we are keen to get the message out that drivers should be aware of everyone on two wheels. A radio advertising campaign will also help enforce the message, as well as bus back advertising and roadside variable messaging signs will echo the message too. Steve Horton, Road Safety Team Leader for Kent County Council, said: “Quite often, it’s a case of drivers looking but just not seeing. “So this campaign aims to remind motorists to think about the smaller more vulnerable road users and take extra time to look out for them, especially when pulling out at junctions.